The following article is adapted from the Report of the Commission on the Eastern Mediterranean sponsored by the University of Haifa and the Hudson Institute. Concurrently, Turkey continues its operations against Syria’s Kurds, using its rapprochement with Russia to give it political cover for more assertive military activity. As he continues tightening his grip on Turkey after the aborted coup attempt in July, President Erdogan’s venture could signal a major divergence between American and Turkish strategic goals. Meanwhile, the Syrian ceasefire brokered by the U.S. and Russia has all but evaporated. Moscow and Washington have ceased discussions, especially after Russian airstrikes destroyed a UN aid convoy in late September. The Middle East, never an oasis of tranquility, has reverted to its traditional template of tension and violence. Both Syria and Iraq are now failed states—targets of opportunity—for terrorist groups that burn their victims alive, and dictators that massacre their own people. The region is also home to a major portion of the world’s energy resources, and a large portion of global maritime trade passes through the various chokepoints that surround and suffuse it. Disengagement is always tempting for great powers. The “Weary Titans” of international politics have an ear for their politicians’ rhetoric of exhaustion and weariness. This encourages isolationism, the cutting of “entanglements,” and the desire to define “national interest” as purely homeland defense. But laying down our burdens rarely works. Enemies’ animosity and ambition is spurred, not deflected if states that benefit from the international order look the other way. This is the first conclusion of the University of Haifa and Hudson Institute Commission report on the Eastern Mediterranean released last month. Commission members included American and Israeli political and military leaders from both sides of the partisan aisle. The report reflects their agreement that disengagement is not an option. The economic relevance of the Middle East as a whole, combined with its chronic instability, the pervasiveness of terrorism and radicalism, and the power plays of larger states, will make the region strategically relevant to the U.S. for decades to come. The authors of this report all agree that American and Israeli interests remain in alignment and that increased engagement will advance the shared interests. Both the Jewish state and the world’s greatest democracy have a critical interest in keeping the seas free for navigation, preventing hegemony on land in the Middle East, and countering both regional and global jihadist movements. The present Middle Eastern strategic situation makes this relationship more important than at any point in the past 30 years, or, arguably, at any point in history. Israeli seapower is a large and increasing strategic concern for the Jewish state. Ringed by hostile countries, Israel relies on maritime transport for 99% of its trade. Additionally, since the early 2000s, Israel has discovered massive oil and gas reserves in its offshore Exclusive Economic Zone. These reserves are large enough to make Israel a player in the global energy market. Finally, nearly all of Israel’s major population centers lie on its coast. Israel’s economy, resources, and very survival are aided immeasurably by the strength of whatever power controls the Eastern Mediterranean. From 1973 onward, Israel could rely on a robust U.S. Sixth Fleet, complete with at least one aircraft carrier, to secure the seas and preserve its lines of communication. In return, the U.S. could rely on Israel to counterbalance regional threats, and advance its general strategic interests. Today’s Sixth Fleet is comprised of four guided missile destroyers and a command ship. This is supplemented on occasion by U.S. surface forces that are diverted from their passage through the Mediterranean to the Persian Gulf, or from the Gulf itself, to strike land targets in Syria. Only four American fighting ships are tasked with controlling one of the world’s most critical maritime hubs. This leaves the U.S. and its allies vulnerable. 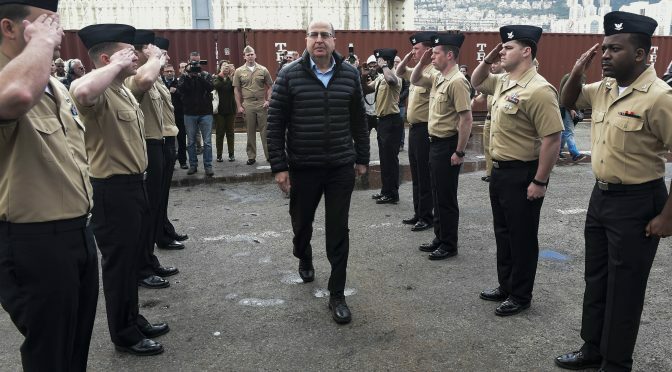 The report recommends several solutions, including greater cooperation between U.S. and Israeli naval forces, and the involvement of potential regional partners. However, there is no substitute for American and Israeli seapower. Future administrations and governments in both countries should expand their naval forces, with an eye toward establishing sea control in a contested environment, deterring mischief, and fighting, if necessary. The Hudson-Haifa report offers future administrations a template for discussing security issues that are critical to two of the world’s most important democracies. Based on sound strategic thinking, rather than ideological biases, it avoids typical Washington political bickering, and analyzes what is in American and Israeli interests. Disengaging from the region, a frequent refrain used by both Democrats and Republicans over the last decade, only makes America weaker at the same time disregarding policy options to the point where no reasonable ones are left. Only through careful analysis and planning can the U.S. and Israel develop proper joint policies to safeguard their joint security and interest. Read the full report: Report of the Commission on the Eastern Mediterranean. Seth Cropsey is a Senior Fellow at Hudson Institute, and director of Hudson’s Center for American Seapower. He is a member of the Commission on the Eastern Mediterranean Report sponsored by the University of Haifa and Hudson Institute. Dr. Cropsey served as a naval officer and as deputy Undersecretary of the Navy in the Reagan and George H. W. Bush administrations.